✅ Make your life nice and easy. ①, Plug in the power cable. After the red light flickered twice, the green light will be on. That's the preheat of the machine. NOTE: Please don't leave the bag in the machine before the preheat. Otherwise the bag will be sealed and therefore the air can't be vacuumed. ②, Place the bag nice and flat into the machine chamber, cover the lid, and lock the buckles on both ends. NOTE: Please avoid the evacuation holes when you are placing the bag. The opening of the bag has to be in the machine chamber. The bag should not contain over 2/3 of its capacity, or the sealing position may not be flat and it'll affect the vacuum extraction. ③, Press the green button to start the vacuum extraction. NOTE: If you find the machine is not sucking enough air, you can press on the trade mark of the lid to increase the forces. ④, When it reaches certain pressure rate, the green light will turn into red light for 3 seconds. The heating fuse will automatically heat up and seal the bag. The red light will be switched to green light and finally be back to red light. That means the process of sealing is finished. (Please wait 3 more seconds for wettish goods.) NOTE: After the vacuum extraction, if it keeps on showing green light, you can press the indicator light on the right hand side of the lid or press the sealing button to help the heat up. ⑤, When the green light is on, turn on the air evacuation valve. Open the buckles on both ends, open and lid and take out bag. NOTE: Please don't open the lid to take out the bag when the red light is on. Otherwise it will iron the sealing into 2 pieces. ⑥, The packaging is completed. ✅ An automotive machine that can do vacuum packing and sealing with one simple press. Fits up to 11.4'' wide quart and gallon heat-seal bags and rolls. ✅ Save your food, save your space, save your time and save your money! ✔ The transparent button is to vacuum air and automatically seal. The seal button is only for sealing without vacuuming air.The opening of the bag has to be in the machine chamber. ✅ Food storage that can keep the color, taste, smell and hydration of fresh fruits, nuts, meat, sweets and vegetables. Goods storage that can keep your valuable items such as photos, letters, jewels, antiques and electronic products from oxidation. 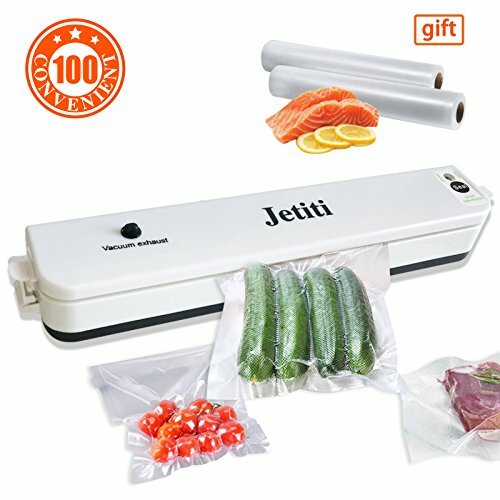 ✅ It includes a JETTI vacuum sealer and 20 sealable bags (9.6in×5.7in). Guaranteed for one year. If you have any questions about this product by JETITI, contact us by completing and submitting the form below. If you are looking for a specif part number, please include it with your message. © 2019 - picalbumdigital.com. All Rights Reserved.